Hydrolysis of N2O5 on aqueous particles coated with organic films. The reaction of N2O5 with aqueous particles plays a key role in regulating tropospheric ozone which is a greenhouse gas and pollutant at ground level. Previous research has shown that N2O5 hydrolysis is efficient on pure aqueous particles. Using a novel flow cell configuration, we have been investigating the effect of organic films on these reactions. These films are believed to be abundant in the atmosphere. Heterogeneous chemistry of pure organic aerosols. Production of toxic/carcinogenic compounds by heterogeneous reactions. Some atmospheric aerosol particles contain toxic and carcinogenic chemicals. What fraction of these harmful chemicals is produced by heterogeneous reactions? To address this question we are studying the heterogeneous chemistry of polycyclic aromatic hydrocarbon (PAH) molecules adsorbed on and absorbed in atmospherically relevant organic particles. Heterogeneous chemistry of aerosol particles using a single particle mass spectrometer. We plan to use our newly developed mass spectrometer to measure reactions of aerosol particles in the laboratory and also in the field. In the latter we will sample aerosol particles from the atmosphere and measure their chemistry. Rotating-wall flow-tube reactor coupled to a chemical ionization mass spectrometer (CIMS). The rotating glass tube fits inside a larger flow tube which itself is surrounded by an outer jacket. The liquid organic is distributed onto the inner wall of the rotating glass cylinder. For conducting experiments on solid surfaces, the rotating liquid films are rapidly cooled by passing a refrigerated coolant through the outer jacket of the ﬂow cell. 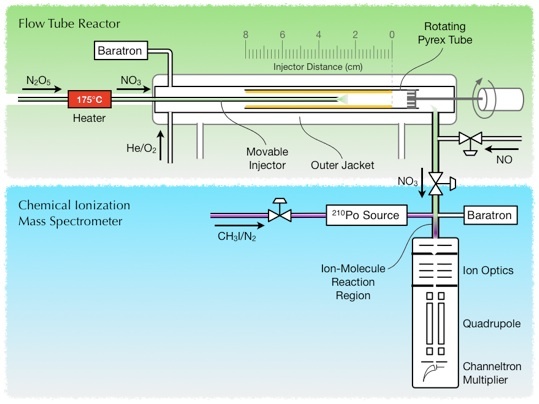 A constant flow of N2O5 (converted to NO3 by heating in a furnace) is admitted to flow-tube reactor through a movable injector. The injector position is periodically moved during an experiment to expose an increasing surface area of the organic coating to N2O5 or NO3. Langmuir trough flow cell coupled to CIMS. The Langmuir trough flow cell reactor (diagram at right) allows for the study of heterogeneous kinetics on aqueous surface coated by an organic monolayer. It is constructed entirely of aluminum, and it can be temperature controlled by circulating coolant through channels in the aluminum body.